Since being back home from uni (quick update, its great I already have a part time job, possible work experience and back with my friends) the weather hasn't been quiet so great but the sun is still out. The pink hair is still going strong! It takes a good pair of trousers for me to replace my jeans but I love really comfy yet pretty trousers just like these, I am wearing them all the time. Denim jacket, patterned trousers and a crop top is pretty much a fail safe look for British summer weather. Did I mention the trousers were only £8?! 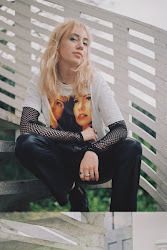 P.S I dont talk about politics at all on my blog (I want to start, but I do on my twitter @afashionoddity) but today is the EU referendum in the UK and its a big deal so please please make sure you go out and use your vote! !